Welcome to Douglas Nursing Home “home from home”! Douglas Nursing Home is a family owned and run care facility catering for the needs of older adults who wish to retire to the safety and care of a retirement home. We also cater for people of all ages who need medical care or physical support in some or all activities of daily living. 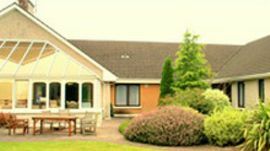 We have facilities for end of life care, long stay, short stay, respite, care and rehabilitation. Douglas Nursing Home is registered by HIQA. We are Private Health Insurers listed and are members of the NHI – Nursing Homes Ireland. 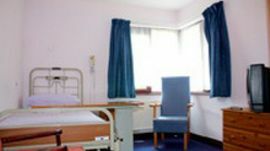 Douglas Nursing Home is a purpose built ground floor facility with single rooms, single en suite rooms. All rooms have hot and cold water, television point, telephone point and call bell. The rooms are decorated in a homely way and residents are free to bring in their own effects and small furniture to make it their own. There are at least 2 nurses on at all times and a team of care assistants, catering staff and household staff to care for the residents every need. Director of Nursing, Janet Woodward, is a highly qualified nurse with 30 years of nursing experience in numerous fields of nursing including elderly care, oncology and care of the terminally ill.
We want all residents to feel at home here whether they are here for a long or short stay and to be able to choose and direct their own care. Douglas Nursing Home is committed to ensuring the residents are as happy and comfortable as possible and living life to its fullest. Douglas Nursing Home endeavors to give every resident the best possible medical, psychological and social care. Douglas Nursing Home will include you, the resident, in our care planning at all times, and to include your family if that is your wish. Douglas Nursing Home provides top quality care in all activities of daily living and all aspects of daily life. Call 021 4364264 to Book an Appointment or for more information on our services and price.